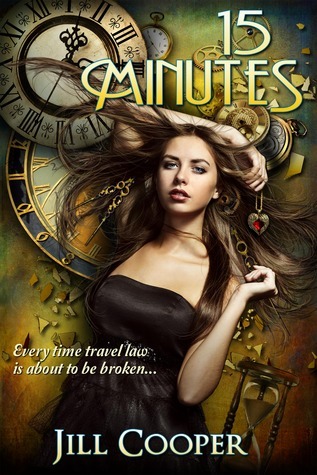 Thanks to AToMR Tours, we've got a review of the new YA sci-fi/time travel novel, 15 Minutes, by Jill Cooper. Keep scrolling to check out our review and then enter to win a copy for yourself! Visit the other tour stops for reviews, excerpts, interviews, and more! 15 Minutes is a fast-paced story about what happens when you try to change the past. That's always the warning of every time travel story, right: don't change the past, don't cross your own time stream, and everything should be okay. The Rewind Agency has rules in place to make sure you don't do that -- you appear in the past more as a hologram than a real solid person, so you can't physically change anything, you can only be there for 15 minutes, and they try to keep you away from times that have significant emotional impact for you. Only our main character, Lara, discovers that she can actually touch things in the past, which you're not supposed to be able to do. So she decides to use her time in the past to save her mother's life, with consequences she never could have imagined. I liked the fact that there were consequences -- bad ones, even -- for Lara changing the past. It's always supposed to be a big no-no, but so many time travel stories seem to find ways around this in order to make everything work out. By Lara stopping her mother's murder, she has changed everything, and it's not necessarily for the better. It was interesting to see Lara have to grapple with this -- sure, her mother's alive, but everything is different. The change she made was not the change she wanted, and now Lara has the dilemma of figuring out how to put everything back to rights to a timeline that only she remembers. I really liked Lara as a main character. She had the best of intentions, and as soon as she realizes how deeply wrong everything has gone, she wants to fix it, rather than just revel in her new life, which I think would be some peoples' natural instinct. She clearly loves her family, and, unlike a lot of other YA books, they are there for her when she needs it. Even in her original timeline, while her dad works lot to be able to provide for her, he's still a quiet presence in her life and she knows how much he cares for her. I thought the conspiracy angle was well done, if a little bit predictable at times. The ending got somewhat hard to keep track of, which can sometimes be a given in time-travel stories. I don't often say this about books, but I wish this one were just a little bit longer so more time could have been taken in the ending. Overall, though, I really enjoyed reading this book. I read it in about a day, and had a hard time putting it down because I wanted to know how it ended! The ending does mostly resolve things, but also sets it up for a sequel, which I will definitely want to check out. Gladly! I can't wait to see what you come up with next! :) Thanks for stopping by.